The Tabàrnia initiative went viral on social media shortly after Dec. 21, when Catalonia’s separatist parties retained their narrow parliamentary majority, winning 70 of the 135 seats in the Catalan Parliament, in a snap election called by Mariano Rajoy, Spain’s prime minister. A news conference in Barcelona this month with officials of Tabàrnia, a fictitious land created and promoted by people opposed to Catalonia’s independence from Spain. While the vote was a setback for Mr. Rajoy, whose own Popular Party finished last in the regional election, it also confirmed the split within Catalan society and left the separatist parties with an uphill struggle to form a new government. On Tuesday, Catalan lawmakers are to decide whether to re-elect Carles Puigdemont as president. He was removed from office by Mr. Rajoy in October, after he and other separatist lawmakers declared unilateral independence. Mr. Puigdemont then left for Belgium and has since refused to return to Spain to face prosecution for rebellion. Mr. Rajoy’s government is counting on Spain’s judiciary to stop Mr. Puigdemont’s political return. Should Mr. Puigdemont be re-elected, Mr. Rajoy warned that he could extend Madrid’s direct rule over Catalonia, using the same emergency powers that forced Mr. Puigdemont’s ouster three months ago. On Saturday evening, members of Spain’s Constitutional Court voted unanimously that Mr. Puigdemont would need to appear in person in the Catalan Parliament to be sworn in. While the separatist lawmakers are struggling to form a new government without incurring more sanctions from Madrid, Tabàrnia’s mock president, Albert Boadella, was elected unopposed. In the waning years of the Franco dictatorship, Mr. Boadella was a co-founder of Els Joglars, a theater company that used mime and comedy to challenge censorship under Franco’s regime. Since 2006, however, Mr. Boadella has refused to produce a play in Catalonia, after suffering what he called a campaign of hatred for helping launch Ciudadanos, or Citizens, a staunchly anti-secession party that has grown into a national political force. Albert Boadella, left, is Tabàrnia’s mock president. In the December vote in Catalonia, Ciudadanos won a quarter of the votes, making it the largest single party in the Catalan assembly. But Ciudadanos is leading the opposition, not trying to form a government, because the three separatist parties won a combined 47.5 percent of the vote, enough to give them a majority, under a voting system that favors their dominance in rural areas. Even if Tabàrnia is a lighthearted pushback against the separatists, Mr. López Alegre noted that the Spanish Constitution, which forbids unilateral secession, does allow the creation of new autonomous regions. And while Tabàrnia highlights the opposition to secession in and around two of Catalonia’s largest cities, residents of the Val d’Aran, a tiny mountainous community along the border between France and Catalonia, have also been warning that they could break away if Catalonia seceded from Spain. Pere Rusiñol, a co-founder of Mongolia, a magazine of political satire, sees Tabàrnia as “an interesting provocation to underline the contradictions of Catalan nationalism.” But if Tabàrnia ever became a serious political project, there could be “a real danger of Balkanization,” he said, even perhaps like the violent breakup of the former Yugoslavia. “What is a game would then look scary,” Mr. Rusiñol warned. For the separatists, however, Tabàrnia is an irrelevant case of sour grapes, coming after an election that failed to yield the decisive blow to Catalonia’s independence movement that Mr. Rajoy had anticipated. Tabàrnia is something like Peter Pan’s “Neverland” for the unionists, said Salvador Garcia Ruiz, the chief executive of Ara, a pro-independence newspaper. Carles Puigdemont at a news conference this month in Copenhagen. On Tuesday, Catalan lawmakers are to decide whether to re-elect Mr. Puigdemont as president of Catalonia. The territorial tensions within Catalonia, he added, are manageable and comparable to those provoked by other heated political debates, like Britain’s referendum on leaving the European Union or the election of President Trump in the United States. “In democratic countries, such differences are resolved at the ballot boxes,” Mr. Garcia Ruiz said. Tabàrnia’s theoretical borders would contain two-thirds of Catalonia’s 7.5 million residents. Unlike the Catalan republic that Mr. Puigdemont and other separatists want, Tabàrnia would swear allegiance to the Spanish monarch, Felipe VI, while using its own flag and coat of arms. 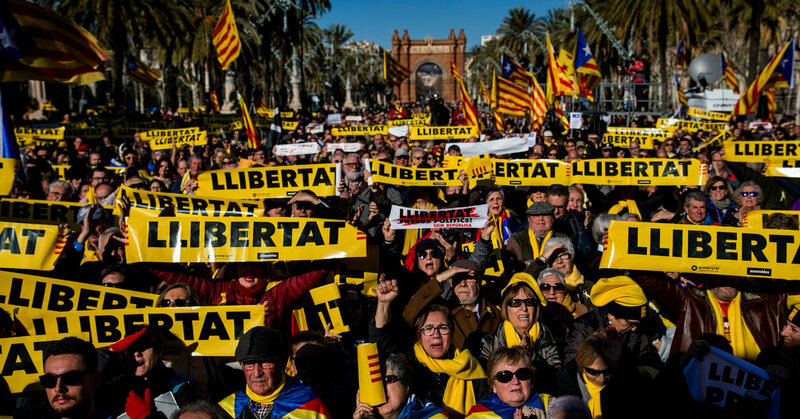 Tabàrnia is a parody, but one that feeds into the debate raised by the Catalan independence movement over “the limits of the principle of self-determination,” said Manuel Muñiz, the dean of the school of international relations at IE University in Madrid. Pablo Iglesias, the leader of Podemos, Spain’s far-left party, recently criticized the promoters of Tabàrnia for fueling a “war of flags” that he said helps neither Spaniards nor Catalans. But Mr. López Alegre, the spokesman, said the goal was never to fragment Catalonia itself, but instead to try to end what he sees as a disruptive chapter of Catalan secessionism. Tabàrnia has its own flag and symbols. “Acta est fabula,” the Latin saying for the “play is over,” is the motto on its coat of arms.